This breastfeeding log allows you to indicate which breast your baby fed on, at what time, and how long it lasted. There is also a column to input any supplemental formula you used. This Printable Baby Planner is available to download for free, or you can download the entire collection for only $14.00. 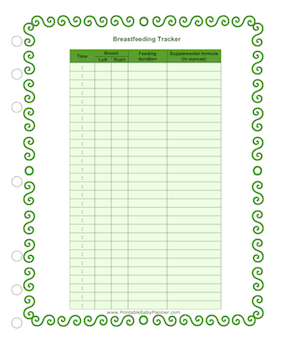 The $14 version includes all of the Printable Baby Planners on this site, in DOC and PDF formats. After purchase, you can download them and use just a few baby planners or the entire collection.